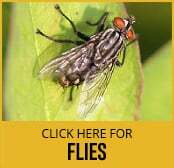 When you find your property inundated with flies swift action is required in order to remove the problem completely. Delaying any kind of treatment will allow the flies to multiply and seriously risk the health of you and your family. When it comes to fly control a professional pest control service is really the only way to guarantee success. Flies are all around us and a vital part of the natural order of things but it’s not very pleasant to have them in your home. Worldwide there are more than 120,000 species but their unsavoury habits mean they pose a risk to the well being of humans, pets and livestock. An infestation in your home or business can be the cause of Salmonella and E.coli diseases and some species have been known to bite both animals and humans. Leaving the problem could lead to a pest control problem of epic proportions as some flies only take 7 days to mature from eggs to adults. It’s relatively easy to spot an infestation and thereby reduce the need for pest control services but once they’ve found their way in you need to act swiftly and be proactive. Choosing professional fly control services will be a safe way to remove the problem once and for all. Certified technicians will quickly have the infestation under control with a service that’s controlled, effective and tailored to your specific needs. Direct measures will include the removal of any breeding sites for a long term solution that will keep you and your family safe.